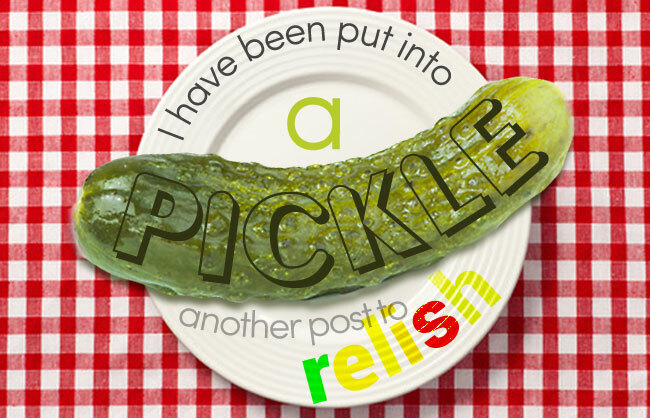 I’ve Been Put into a Pickle, – another post to RELISH! Shall I wax rhapsodic about the taste and flavor of the perfect pickle? Not the annoying kind that’s irregularly shaped, a ridged factory slice that looks like a pinking shears, Edward Scissor-hands by-product. I’m talking about the ones that look like actual cucumbers and have the right texture. They explode with garlic, acidity and brine, perfectly balanced with the requisite crunch and refreshing without being too watery. Well, if you understand that, then bad pickles are an affront to the senses. Bad pickles are neon yellow often placed next to your hero at the diner. You reluctantly bite into them only to be taken aback by the squishy, sad vinegar laden mess which leaves an awful taste in your mouth. It ruins your whole meal! Yup, we have all been there. I love pickles and if I were to manage a restaurant, I would institute a Pickle Oversight Committee to ensure that all pickles meet the highest (my) standards. While I day dream of munching on this cultivated gourd, I can’t help but wonder why the cucumber hasn’t been used in fashion styles like other fruits such as the apple, pineapple, or grape? Yes, kiddos, the cucumber is indeed a fruit, having an enclosed seed and developing from a flower. How to marry my love of fashion with my love of the pickled cucumber? Like a lightning strike, I found a PICKLE HAT! The discovery caused me vertigo and brought on a panic attack. I found this Maybelle Marie Birch straw hat from the 1950s on 1stdibs.com. It is so charming and whimsical I had to recreate it. It was way too expensive and I had a hunch that the look could be replicated. I immediately scoured the internet in search a pointy straw hat, decorative pickles and vines for my latest DIY project. After hours of perusing, I located a beachcomber Mexican straw hat from the 1950s on retroartglass.com that Mods used to wear in old beach party movies. I bought the hat and was thrilled by the design potential. I turned to illustrious fashion designer, Jamie Kreitman, to help guide me through this project. We used 6 inch foam pickles purchased from officeplayground.com, chenille vine, pink chenille roses and gem stones. 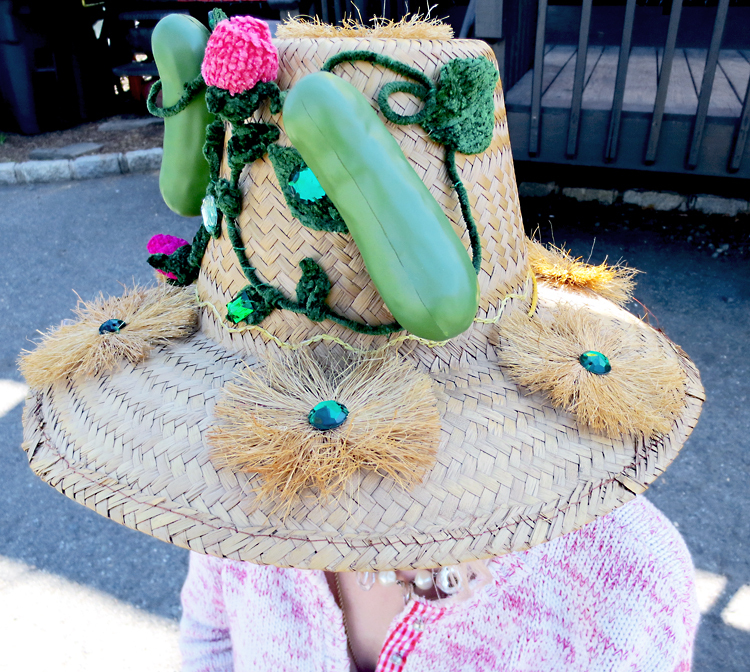 With the Maybelle Marie Birch straw hat as a reference, I pinned the pickles, chenille vines, leaves and roses to form a pleasing design around the hat. I stitched the components by hand, then placed the gems strategically to highlight the floral pickle motif. 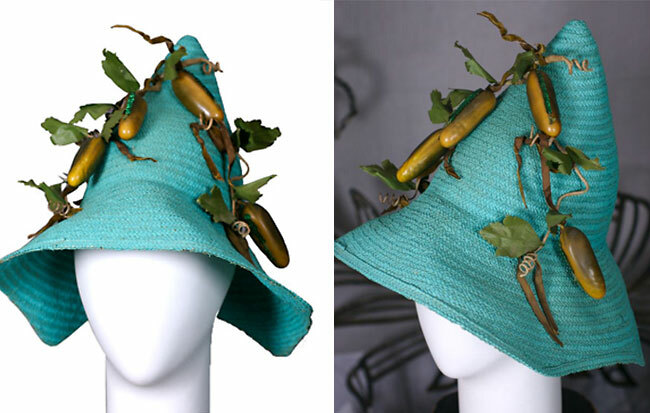 The final result is a pickle hat which can be worn by organic farmers riding on tractors, bearded Warby Parker bespectacled, flannel wearing roof-top gardening Brooklynites and street-stylers photographed by Bill Cunningham of the New York Times. 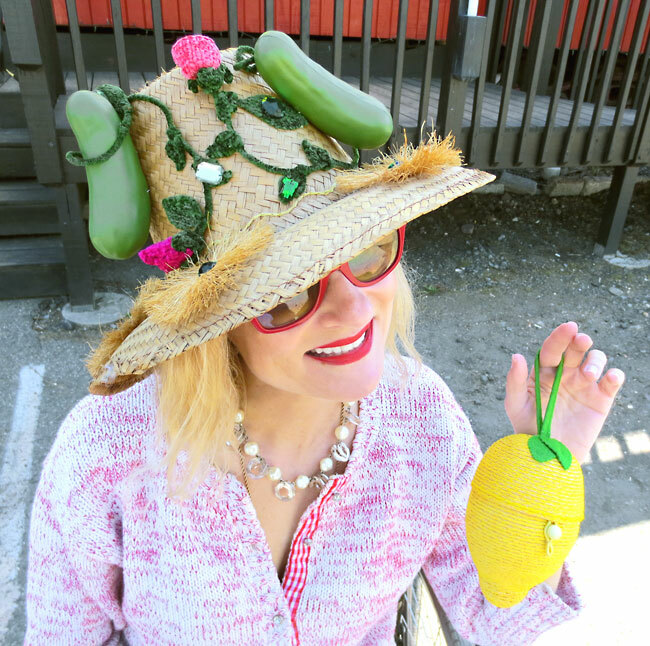 What do you pair with a pickle hat? Why a vintage lemon straw purse, of course. As with most of my posts, I needed to take this to the public and expose my affinity for fashion crafting and pickle-love to the outdoor-pajama-wearing crowd. 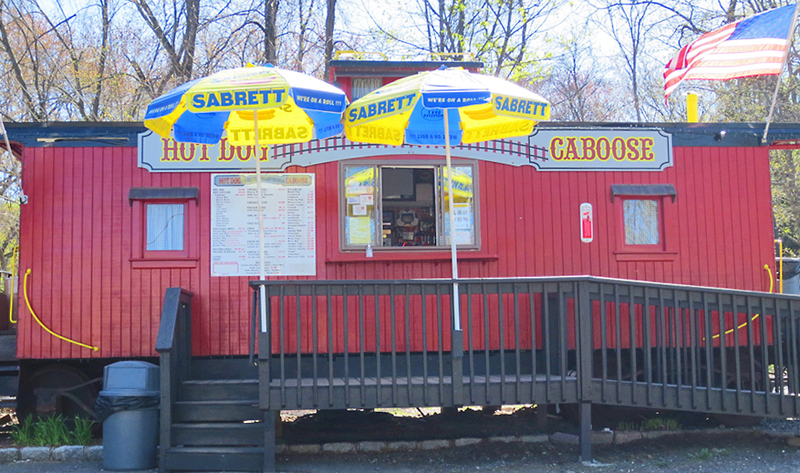 I thought of the perfect place to visit: The Hotdog Caboose. 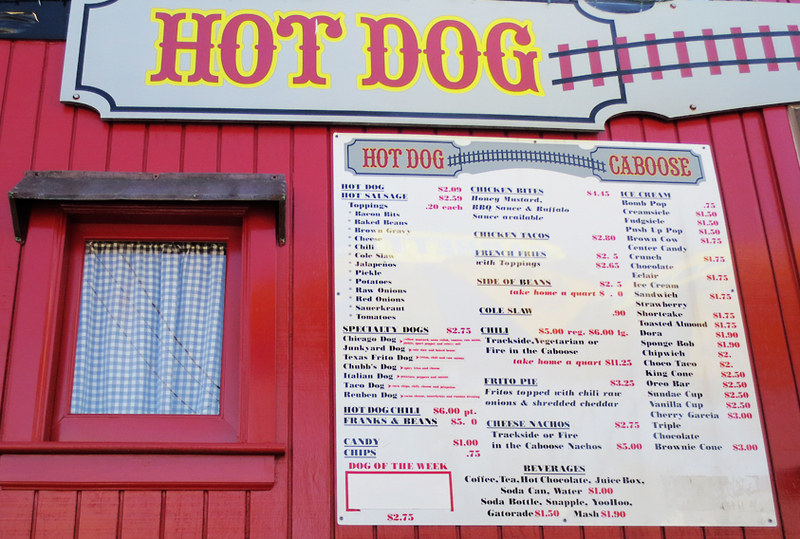 This 7 year-old outdoor family owned business in Midland Park, NJ, is the perfect place to grab a casual bite of America’s oldest and favorite meal–the hot dog. The menu is concise which is a pleasure compared to the offerings at the big chain fast food restaurants. Hot Dogs and specialty hot dogs are their main staples, but they also sell chili, soup, chicken bites, tacos, frank and beans, french fries and even gluten-free and vegetarian items. All items are reasonably priced and family friendly. 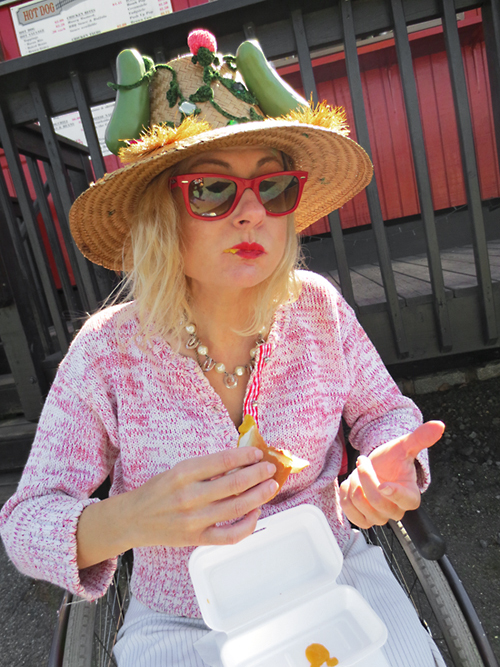 What should you wear to the Hot Dog caboose? Jamie Kreitman® gingham sweater, Ray Ban® sunnies, Cecile Jeanne necklace, Vertigo pin-striped pants, polka dot saddle shoes by Bass shoes. 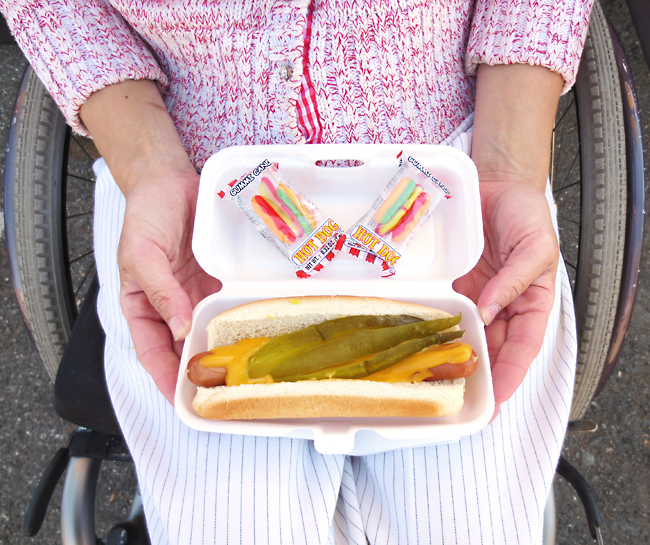 My pick was two hot dogs topped with nacho cheese and pickle spears. Ahhh, if only that fleeting hot dog flavor could linger a little bit longer! I relished all the melted cheese that covered my face and fingers. Just when I thought my afternoon couldn’t get any better, Erin offered me two gummy-hot-dog individually wrapped candies. I LOVE GUMMY ANYTHING! They usually offer them to kids, but the pickle hat warranted the special treatment! I went on and on about how adorable this establishment is and Erin rewarded me a gummy dog or two! The caboose itself is over a hundred years old and was in service in Jim Thorpe, Pennsylvania until the 1970s. It now sits in the historic Wortendyke Station, which was built in 1865 and now serves as a pottery studio for all ages. Not so sure where I will wear my pickle hat next. Perhaps for a tour of the Heinz factory of Pittsburgh which was just converted to luxury condos? Could my crafty creation serve as an accessory linchpin for savory condiment memories? Two down, five more to go. Wash it down with a diet Pepsi and that little purple pill. I’ve learned that you don’t need to settle for department store fashion banality. Just grab a fashion cognoscenti and learn how to fashion an item to suit your sartorial needs. Make it amusing, droll and daring. And on my style laundry list, make it as edgy and spectacular as possible! THE MET MUSEUM Rooftop Psycho Barn is CRAZY! Maybelle was my Grandmother and although she passed away a few years ago, I'm sure she would be pleased to see that some of her creations are still around and giving inspiration. Thanks for writing me Heather. Your grandmother was so darn talented. Her creations put a huge smile on my face. I had no idea she passed away a few years ago. You can't find too many of her works online unfortunately. I wish I could get my hands on everything she ever created. Take care. Hankering for a chili hot dog as I read this! 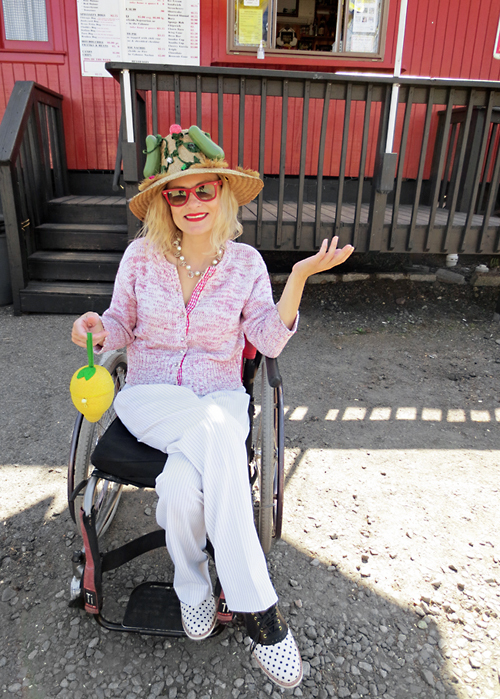 You ROLL, Ms. Magdalena!